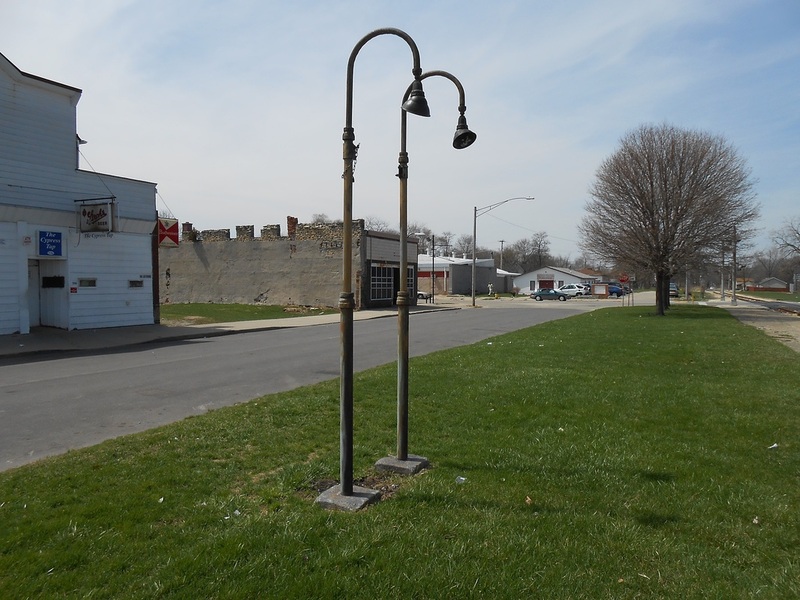 ﻿﻿ T﻿﻿he route was chartered from Lafayette, Indiana to Kankakee, Illinois. Kankakee was not to be the ultimate stop, like most railroads, the Big Four was interested in Chicago. (one of the "Big Four" in the name) At Kankakee the Illinois Central could be accessed as a direct route to the Windy City, and so it was. The route was carried out and built. 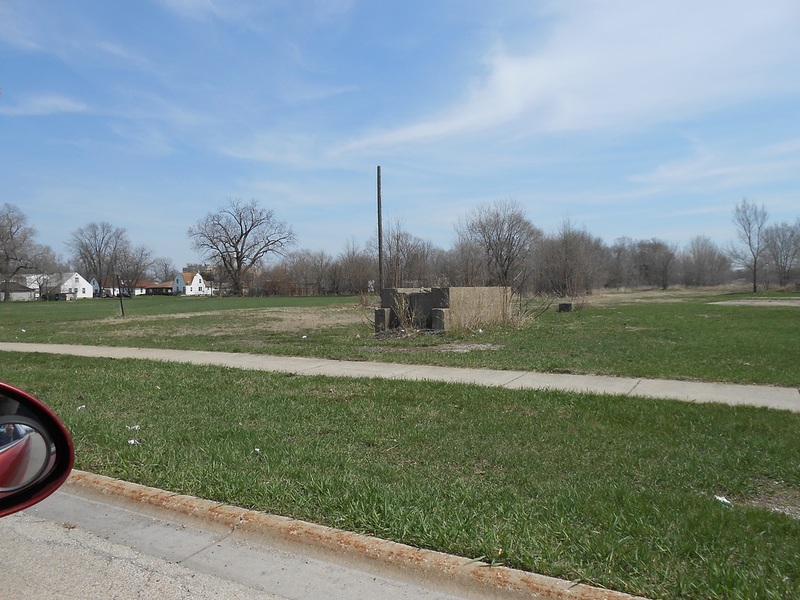 Through small towns like Donovan and Sheldon, IL did it run, but to Kankakee did it terminate. The line split up into a large curved yard in Kankakee with a roundhouse. 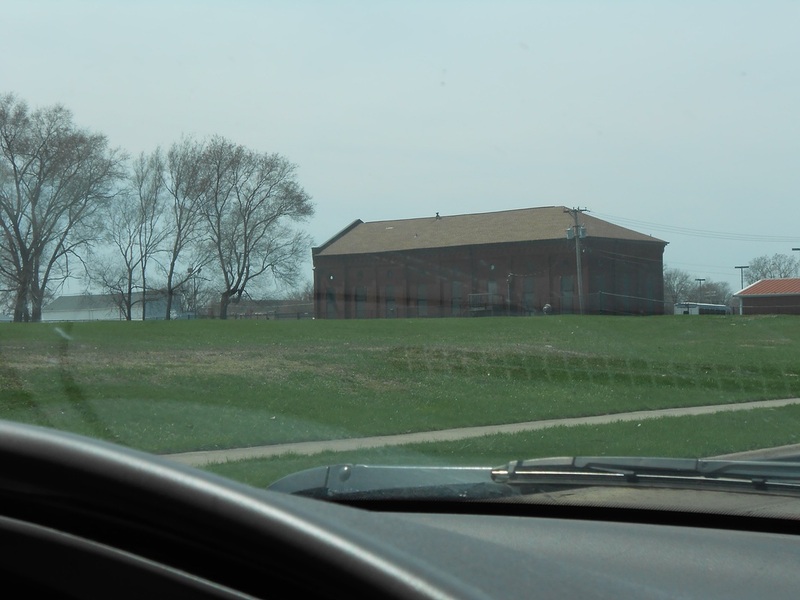 This roundhouse had coaling facilities and more, and a local gas plant set up right along the railroad as well. 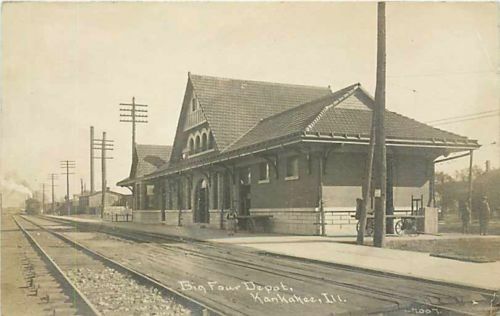 Freight depots, a passenger depot for the Big Four and more were established in Kankakee. 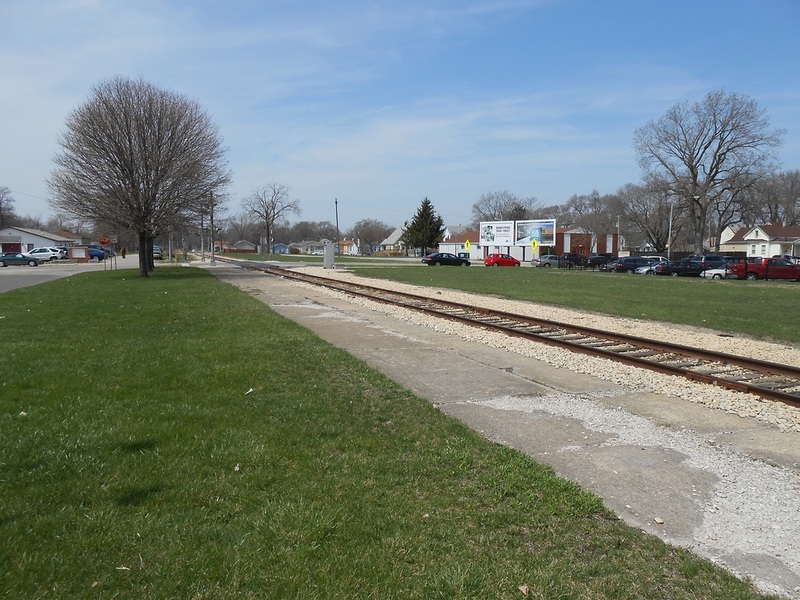 From this line did a western line run known as a Kankakee and Seneca Railroad. This was a joint venture between the Big Four and the Chicago, Rock Island, and Pacific Railroads. 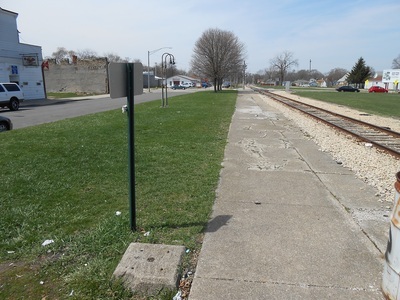 This is the reason they crossed the Illinois Central rather than simply terminating into it as the Kankakee, Beaverville, and Southern Railroad does currently. The KB&S, speaking of which, is a family owned shortline. 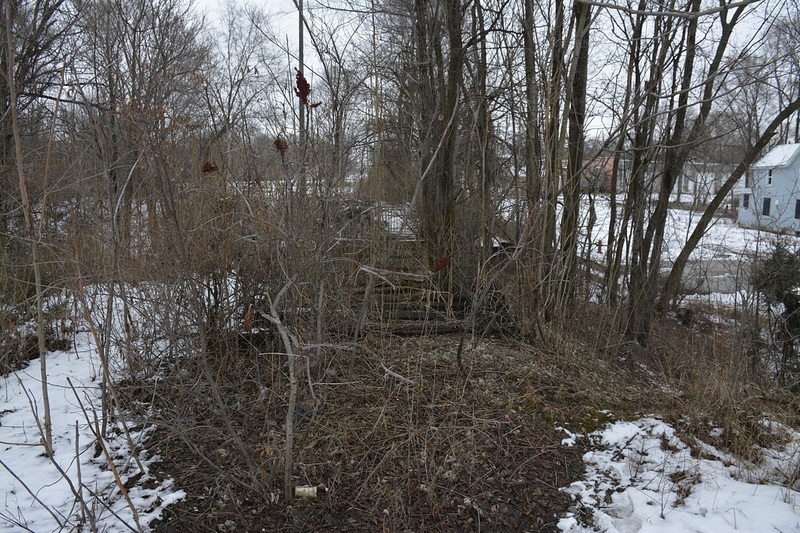 The story behind that is that the line eventually fell under New York Central Railroad as the Big Four was purchased in 1930. The NYC merged with the Pennsylvania Railroad in 1970 to infamously create the Penn Central Railroad. Very little changed during this time. It was not until Conrail came into the picture in 1976 did changed grip this line. 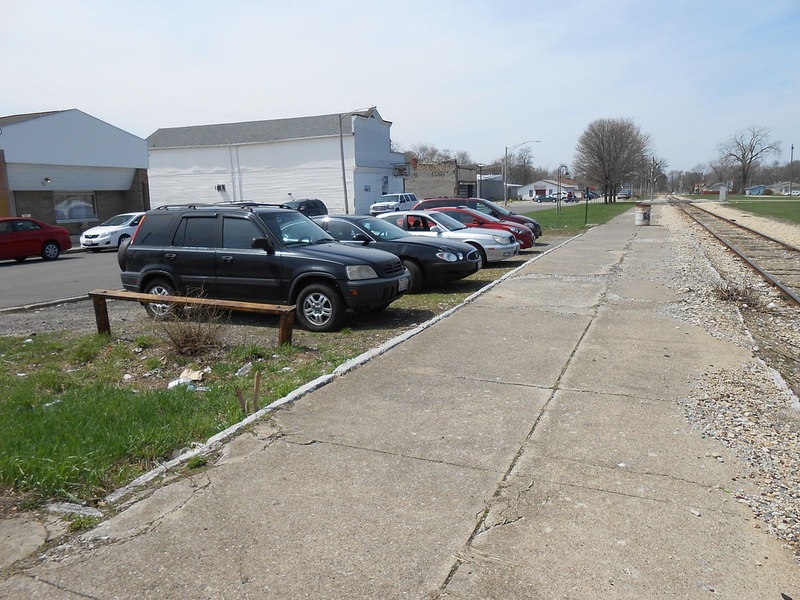 Conrail failed to see the profitable side of the now disarrayed rail link to Lafayette. 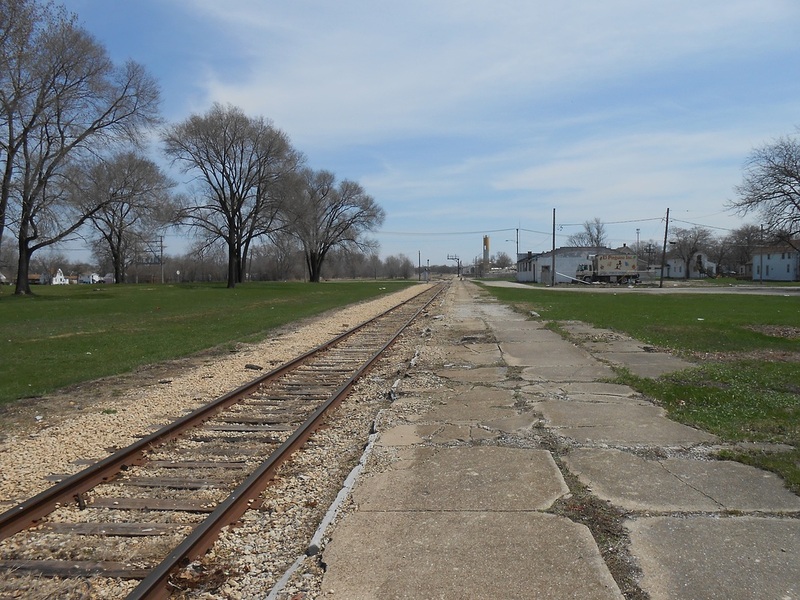 In 1977, Conrail abandoned the line from Kankakee to Sheldon, IL. 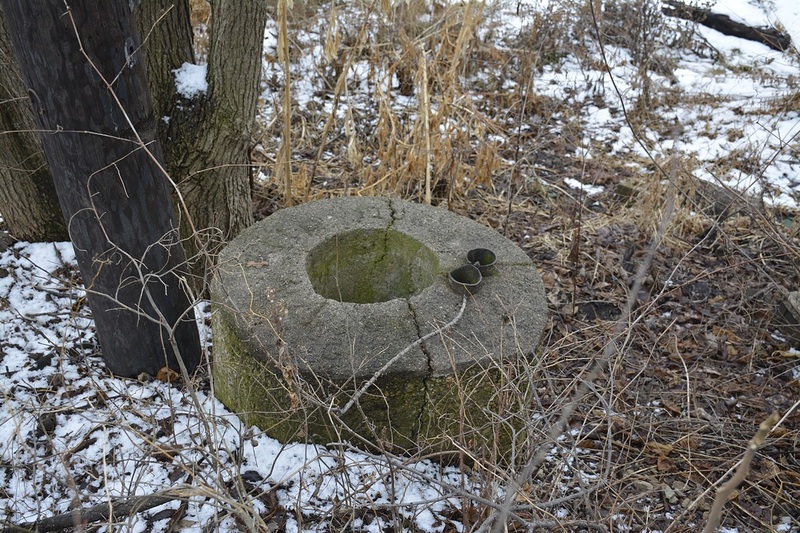 This is when a local businessman by the name of Steve Orr purchased it and founded the Kankakee, Beaverville, and Southern. Thus preserving the route. 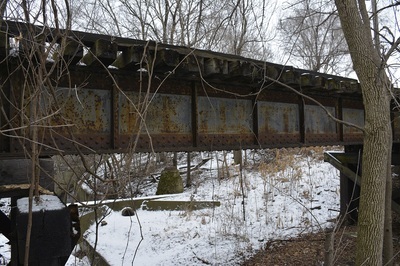 Eventually the rest of the route was owned by the Kankakee, Beaverville and Southern as per abandonment. 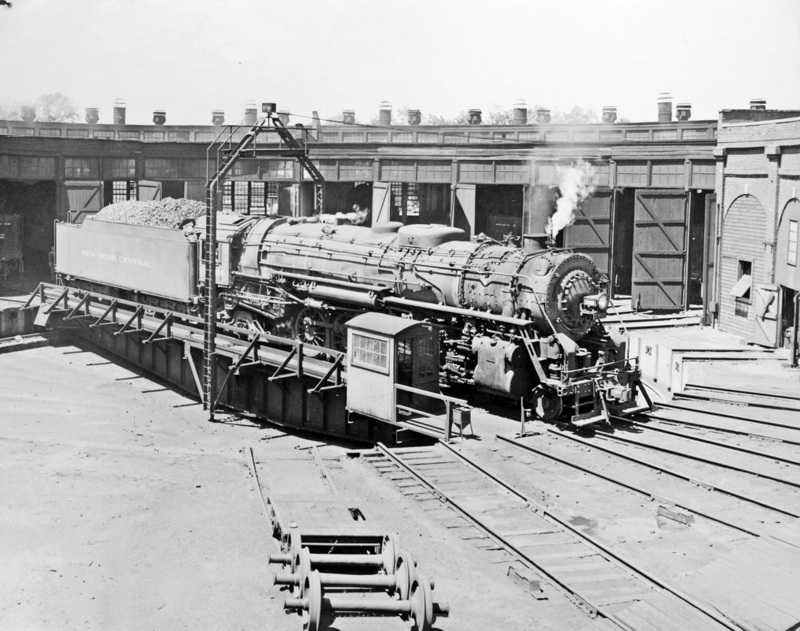 The yard was once massive curved and straight work of engineering. 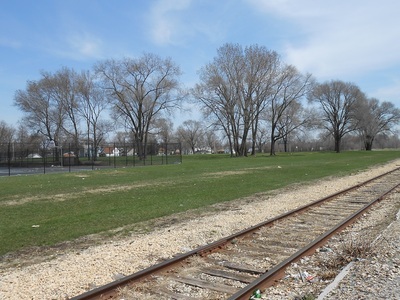 The yard consisted of many tracks, likely 15 to 20, and started branching out north of Court Street and did not recede until just before Schuyler Avenue. There were multiple track over Court Street that lead into the yard lead and two track exiting that crossed Schuyler. One track went straight over the Illinois Central and shot over Entrance Avenue and 5th Avenue right along what is currently Cypress Avenue. 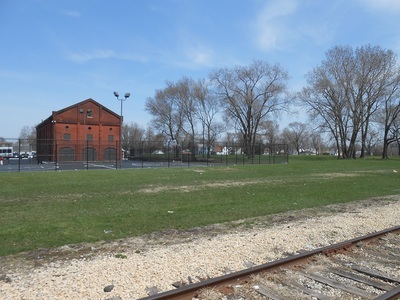 Within the yard, there was the Kankakee Big Four Station and the Big Four Roundhouse complete with loco servicing facilities. Below is an overhead image of the yard dating back to 1935 from the US Geological Survey to which I added text to guide you. 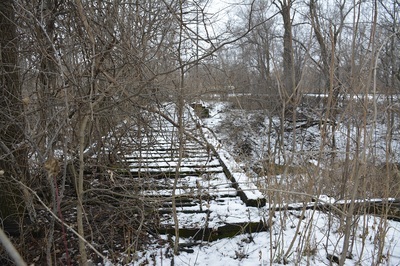 Currently, only two tracks remain from the yard. 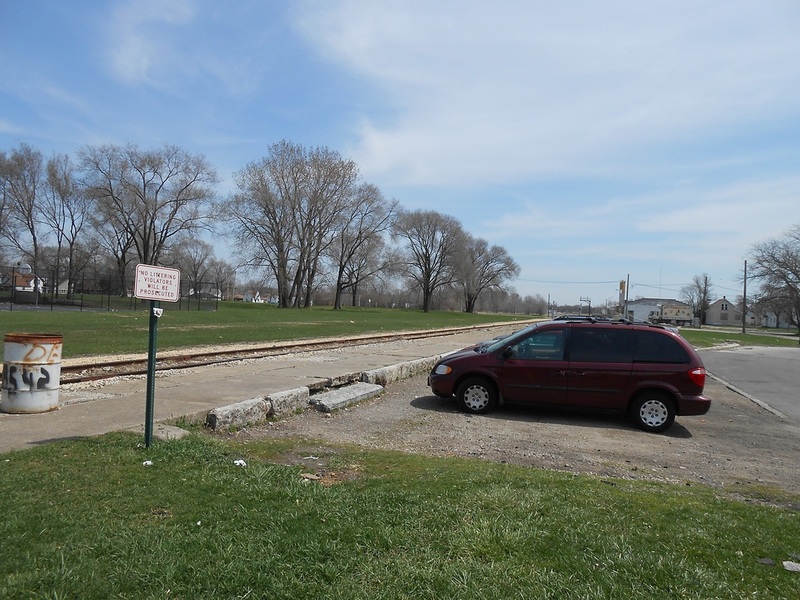 The location is used as a runaround point for the Kankakee, Beaverville, and Southern railroad. 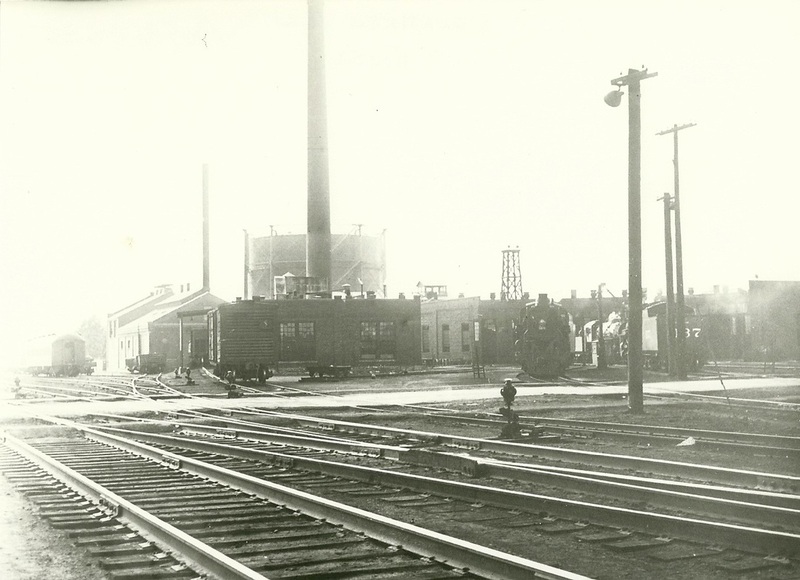 The station was constructed south of the tracks facing north along Cypress Avenue between Harrison and Greenwood Avenues. The station was a busy transfer of trains on the Big Four and saw use into the New York Central years, but not into the Penn Central/Amtrak years. This image to the left is the only picture I could find of the station. This is a low resolution scan of an original image. Interestingly enough, many remnants remain in the area of the station. 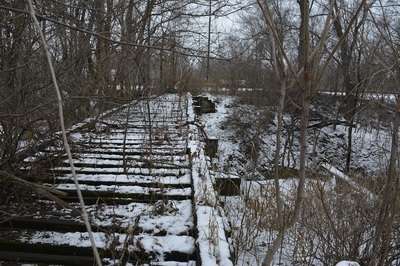 Most of the platform, though weed filled and broken, remains. A parking lot has been furnished out of the old station foundation. Below are pictures of the stations area today. The roundhouse on Greenwood Avenue sat across from the station on the northern side of the tracks. 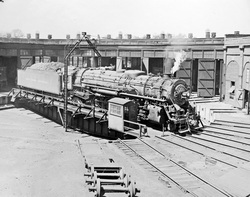 Shown to the left is an image of the roundhouse taken in July of 1952. This depicts New York Central 2986, a L-2d class Mountain type. This is because the Big Four eventually would be bought by the NYC in 1930, but it was a subsidiary lessor and thus the name was kept. The railroad was put out of commission in 1976 when Conrail was formed in succession of the Penn Central Railroad. I was lucky to meet a man who once worked here as a firebox cleaner. He remembers once or twice they actually got J-class steam engines and more. Such streamlined locomotives were frequent as the Big Four ran trains from Chicago onto the IC which got onto their tracks here at Kankakee. The engines would be serviced, or at least coaled and watered, before continuing. Some trains went as far as the east coast. Below, you can see an overhead view from Google Earth of the location of the roundhouse today as well as ground-level images. 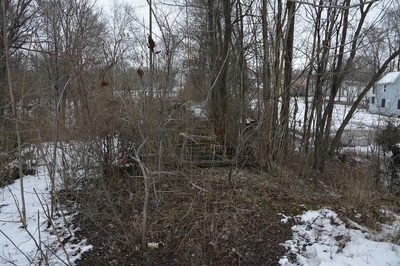 The only section that remains of the roundhouse is some sort of auxiliary building that is now used by the local church. 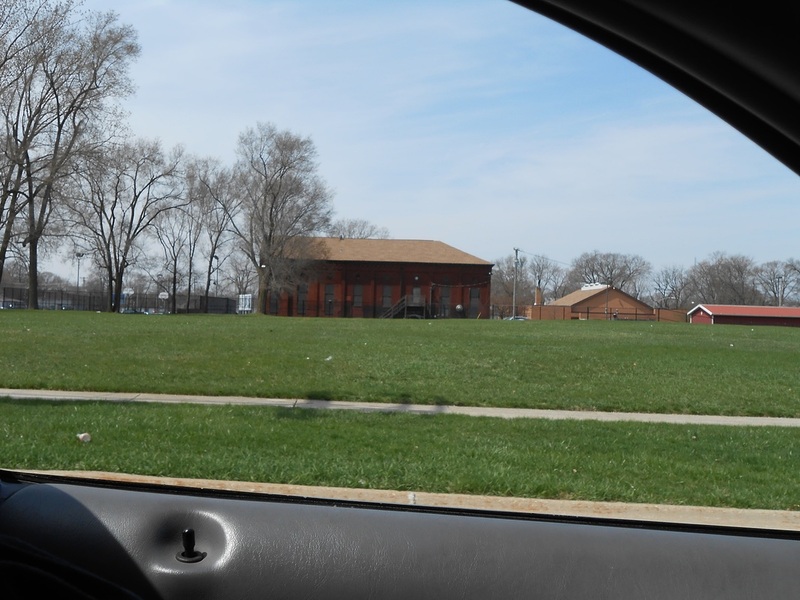 This was confirmed by a woman who works with the church who stated the church was originally looking to tear down the building for a new addition. 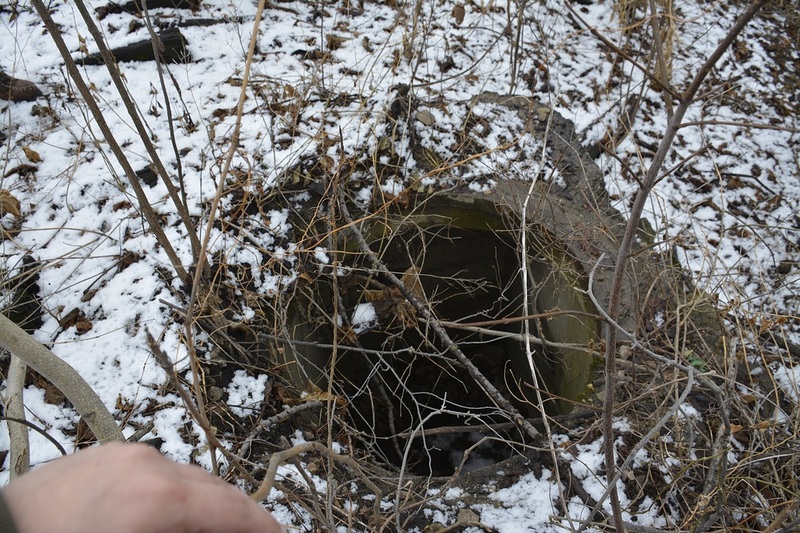 It was found to be protected due to its historical value. I should hope! 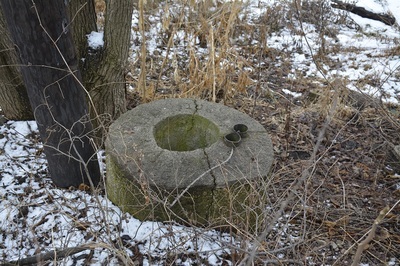 It stands today serving use for the church. Roundhouse employees Harry Dellibac is on top of the ladder, with Bill Toroctte below. June 30th, 1956. 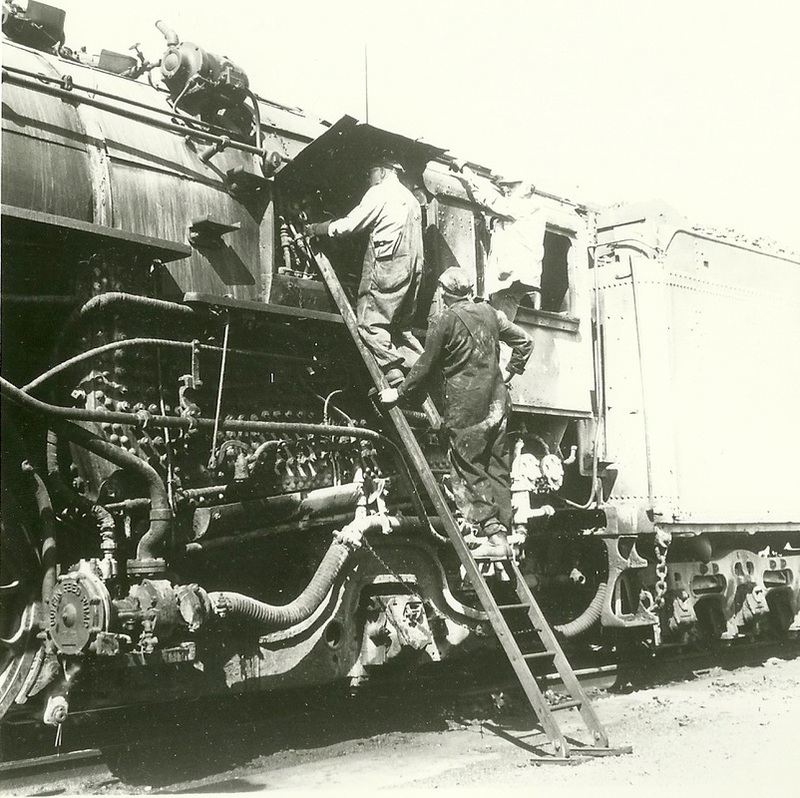 New York Central #2849 was having its injectors cleaned out as seen to the left by roundhouse employees Harry Dellibac and Bill Toroctte. 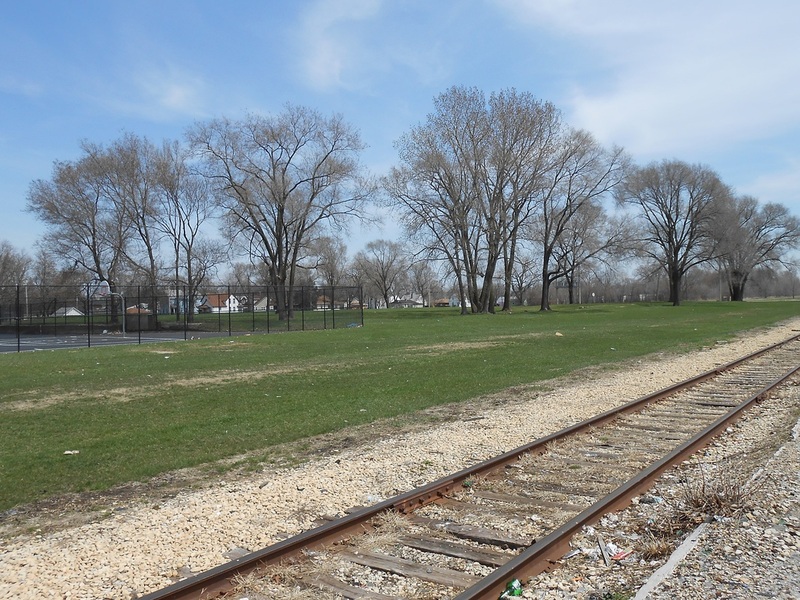 This was no ordinary day, as NYC 2849 would become the last steam locomotive to operate for the NYC in Kankakee. On the brighter side below, in 1950 this shot was also taken from Greenwood Avenue of the roundhouse. Two steam locomotive are seen getting ready to depart. The coaling tower awaited them on the east end. Both images were provided courtesy of Mark Adams. A cold morning is in the air as the NYC roundhouse prepares two locomotives. 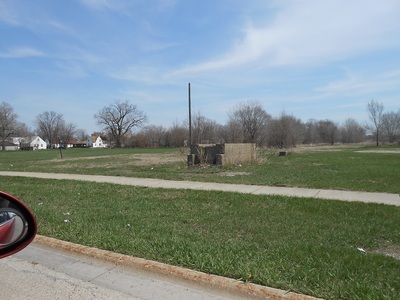 Regardless of the area being a yard, the houses around it said otherwise. 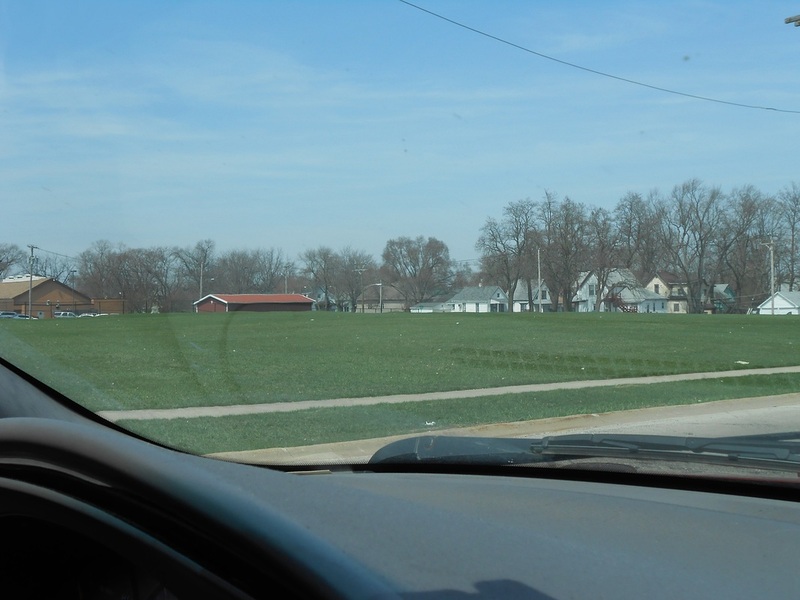 Thus this yard had many crossings as well as the Big Four in general in Kankakee. Major routes crossed included a northwest to southeast directional main out of town crosses Court Street. 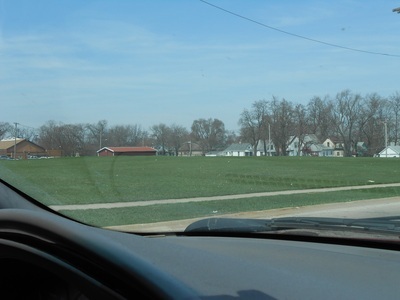 (Illinois Route 17) In town, Illinois Route 50 is crossed twice... that is because the 4 lane route is split into two 2-lane one-way roads. Harrison and Indiana, north and south respectively. 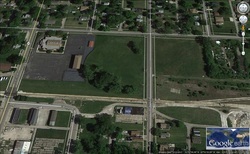 Greenwood, Schuyler, and Hobbie Avenues were also crossed. 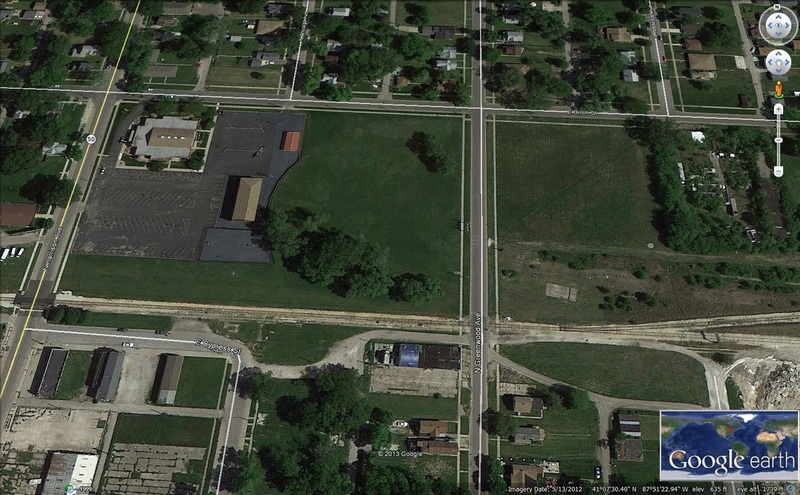 West of the Illinois Central; Cypress Avenue was paralleled and thus crossed Washington, Union, Entrance and Fifth Avenues as well as Adams Street. This particular western section is described later. 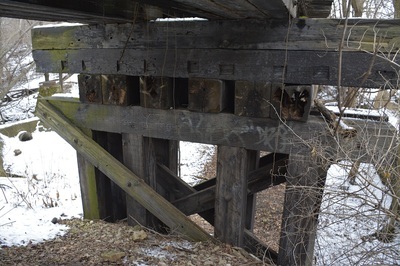 Some crossings have been cut up. 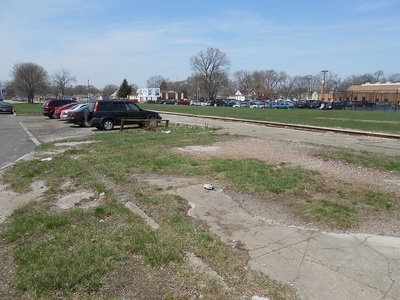 This in instances where the yard tracks were removed so that such a new gap was created to warrant two separate grade crossings rather than one large crossing as previous. 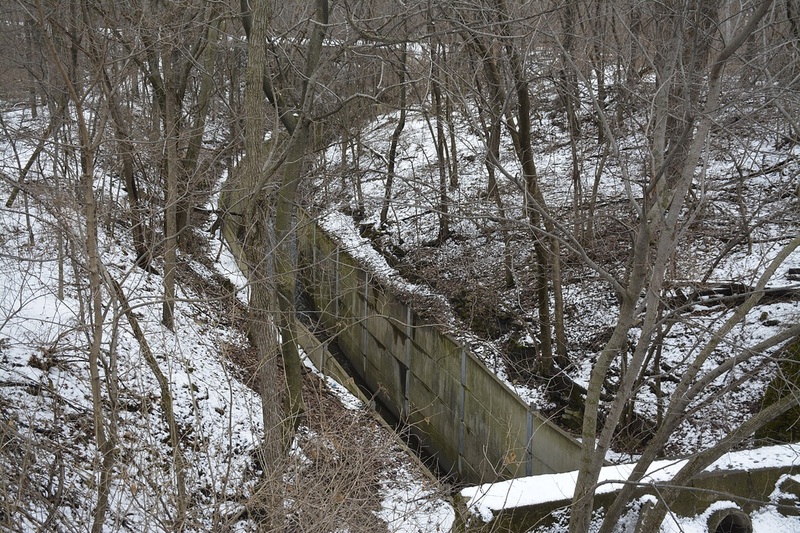 A large concrete drainage stream was constructed along the IC and through Kankakee. This was crossed twice by the Big Four. Once on the straight westward track that connected to the Kankakee and Seneca - and once for the curved interchange line that fed into the Illinois Central. These are the only bridges owned by the Big Four that excludes the Kankakee and Seneca portion. (they had a Kankakee River Bridge) Below are images of the abandoned bridge. The interlocking had no tower as it was controlled by KX tower on the IC - already placed at the northern diamonds. 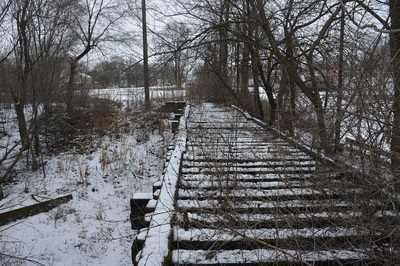 Signals stood here as well. Notice the battery well and signal base. The New York Central steered the Big Four in a slightly different direction. From my understanding, this was not far from what the Big Four was onto themselves... much like the Illinois Central being bought by Canadian National. The Big Four being acquired by the NYC was a huge deal for the Kankakee area as the NYC has previously acquired the Chicago, Indiana and Southern (previously the 3I) whose line ran east to west from Indiana through out to Streator, IL connecting to the AT&SF Railway. 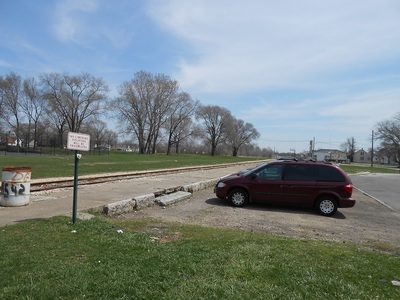 Today this line is the Norfolk Southern Kankakee Line which still connects at Streator with the BNSF Chillicothe Subdivision. That said, this line has grand potential, and under a giant like NYC they were always looking for ways to add-onto this valuable Chicago bypass route. 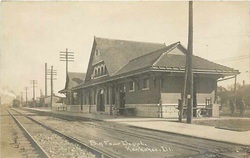 This was not the reason the Big Four was purchased, but as a result, the NYC was now able to directly send trains from Kankakee down to Lafayette, Indiana all without leaving home rails. 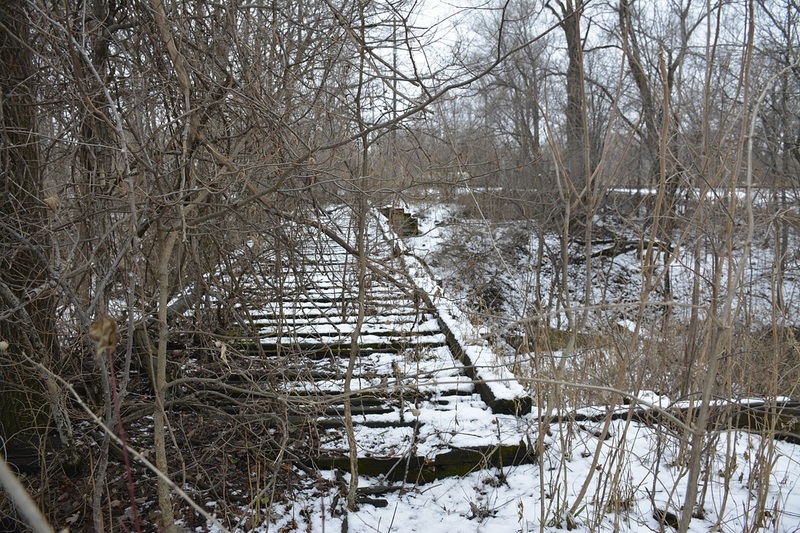 The Kankakee and Seneca was abandoned in the 1930s, this meant the only reason that the western section from the Illinois Central to the NYC (CI&S) line existed was to provide access directly from that line onto the Big Four and the New York Central knew what they were after. 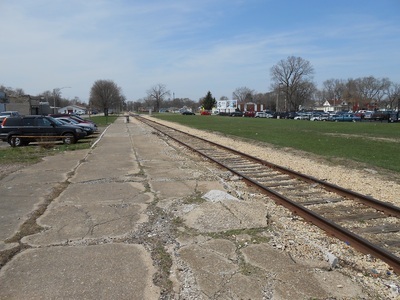 Shortly after acquiring the Chicago, Indiana and Southern (3I), the NYC started construction on the Kankakee West Yard at Main Avenue which would be behind many industries. This yard was finished and was already years into service as the Big Four fell into place. This set the NYC up perfectly, coupled with their north/south Egyptian Line in Indiana, for a near monopoly of the area freight only regionally rivaled by the Milwaukee Road or Chicago and Eastern Illinois. That said, the line became home to high speed freights and blistering passenger runs - all passing through K3. It is hard to say what truly changed during Penn Central's era. Obviously by the 1970s, the rail line saw disrepair as many did following the construction of our nation's Interstates and new found love of automobiles. Passenger trains had been falling off the timetable as decades past, and wartime traffic died out leading into a new era of the Big Four that would last until the 1977 abandonment and rebirth. PC followed a lot of NYC standards for signals and track. The only changes were those to save money, track was likely torn out (it is suspected this the time when the roundhouse were torn down and the yard tracks torn out) and stations were disregarded (Kankakee depot stayed well beyond the roundhouse). Passenger service was down to just the James W. Riley train in both directions (trains 303 and 304 - now assigned to Lincoln Service trains) by time Amtrak took a hold. The trains did not last in service beyond Conrail ownership. 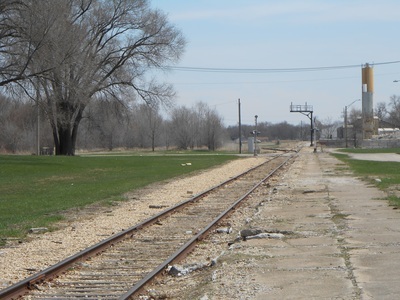 In 1977, Conrail assessed that the railroad line did not make enough for overhead costs and decided to set the line up fro abandonment between Sheldon, IL and Kankakee, IL. Steve Orr, a local businessman, bought this line and worked very hard to get money up to finish purchasing all the locomotives and equipment. 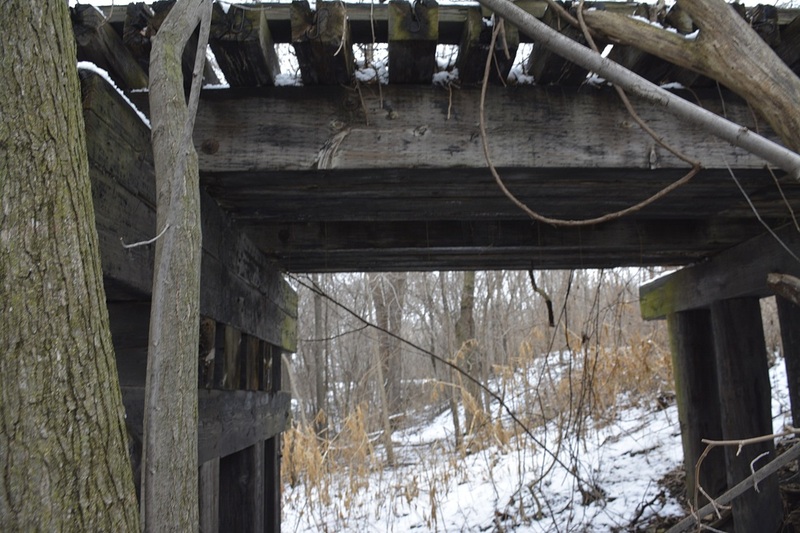 The primary driving factor was the convenient location of the abandonment, and the obvious fact that many grain companies and communities still relied on this rail connection if Conrail realized this or not. Kankakee, Beaverville, and Southern so far has further dialed down the original glory of the New York Central. Yet, what is this railroad to do? Signals removed from service are ones who's purpose is long begone with the Penn Central. In the absence of busy rail traffic, high speed passenger trains, and steam locomotives - many facilities are gone and many junctions are shadows of their past. Even so, the KB&S still provides a vital service and uses the bridges and mainline almost daily. In a sense, they are the best sort of railroad museum, one that not only preserves a railroad, but also runs it. I'm constantly out and about, so expect updates to this page. If you have a story you'd like to share or more information to share - please contact me and I'll add it in!